For the price this is an excellent product. The guard and adjustment are the BEST. it’s so easy to adjust to your length without storing annoying guards in your drawer. The battery lasts plenty long, both for single use and overall. I’ve had mine for a couple years and it still works great. Highly recommend this to anyone. The Remington MB200 Titanium Mustache and Beard Trimmer is a sleek, adaptable grooming tool designed to help you stay looking sharp. This trimmer features Remington’s sharp, long-lasting blades. Easily switch between nine lock-in length settings for a variety of trimming lengths. The trimmer includes multiple features that make it more convenient, like a rechargeable battery, ergonomic shape, and washable build. The Remington MB200 Trimmer comes equipped with titanium-coated, self-sharpening blades. The titanium coating makes the blades strong, durable, and long lasting. The wide blade delivers a fast, efficient trim, while the detail blade is great for trimming in tight spots. The blades are also precision ground, rather than stamped, for superior cutting performance. Nine different length settings allow for a variety of grooming lengths, and a zoom wheel makes picking the desired length simple and easy. This groomer also features a powerful motor, so it makes short work of even the thickest hair. The MB200 is designed to be quick, easy, and comfortable to use. The design begins with a curved ergonomic shape and rubberized grip, so it is comfortable to hold and easy to maneuver. The trimmer’s head is washable–a quick rinse removes loose hair. The MB200 features a rechargeable battery for handy, cord-free use. 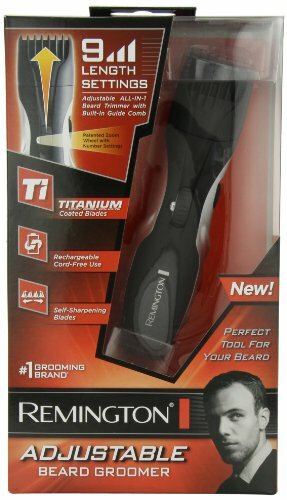 Remington MB200 Titanium Mustache and Beard Trimmer and user’s manual. Removable guide / length comb. This is a full and complete review of the Remington MB 200 beard trimmer. It's a budget beard trimmer which does a pretty good job and is recommended for most people. This entry was posted in Manual Shaving and tagged Beard, MB200, Mustache, Remington, Titanium, Trimmer.